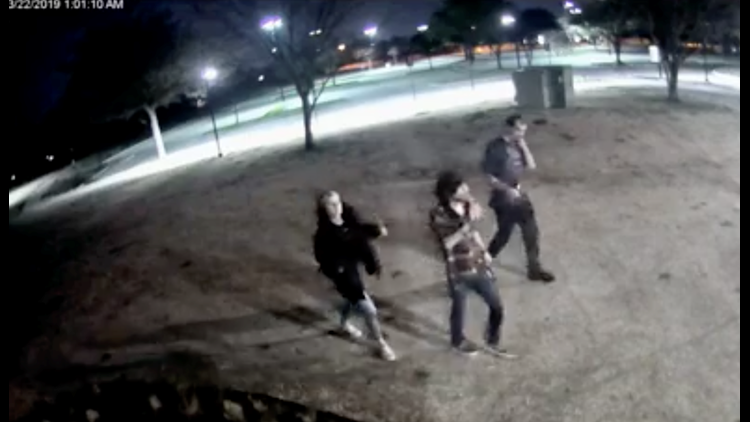 COPPELL, Texas — Coppell police are looking for three vandals who police say took books from the free library at Kid Country Playground/Andy Brown East Park and set them on fire at a playground Thursday night. The suspects also ripped pages from the books, police said. They arrived at the park in a dark-colored SUV or hatchback, and also damaged air conditioning equipment in the bathrooms and damaged sculptures in the park, police said. Police think the three suspects are also the same ones who caused more than $9,000 worth of damage to the same park in 2017. A thin white man, 20-25 years old, 5-foot-7-inches tall, "shaggy hair"
A 16-25-year-old woman "with a thin build"
Anyone with any information is urged to call Coppell Crime Stoppers at (972) 436-8477.